The third place of my pilgrimage in the summer of 2018 was Kildare, Ireland. And my journey there really began the year before. In 2017 I experienced an event that deeply traumatized me, shook me to my core. I knew a profound betrayal and found I had been caught in a web of lies and in a situation I thought was safe but was not. One of the most important things for me is to feel safe. To realize I had been in a situation that was not safe caused me distress and much anxiety. At home one night as I lay in bed I felt the impact of this betrayal in my heart and my body trembled with the shock of it all. But in the middle of that night, I was awakened with a sense that I had never known before. I still don’t know how to put it into words. However, the sense I knew was of fire flowing up and down my body. The fire felt cleansing, healing, restorative. 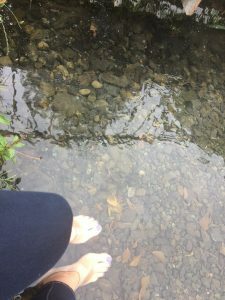 As I felt it go through my body, I knew I was being set free of the trauma and it would no longer have a hold on me. And eventually I fell asleep again. But I awoke with this song alive in every cell of my body. For the next few days I sang it over and over again and continued to be awed by the transformation that this experience had brought to my mind, my heart and my body. I was OK and knew I would be totally OK. I began to sit at the piano and sing this song, realizing that I wanted to include it on the album I had already begun to record. One day as I was sitting at the piano, a woman came for a singing lesson. As she came in, I noticed she was carrying a large piece of art. I wondered why. She brought it into the music room with the back of the art turned towards me. I began to share with her that I was working on a song about fire. I didn’t tell her my story. Then she told me that she had bought this piece of art for herself but as she prepared to come to my house, she knew she was supposed to bring the art to me that day. She turned the piece of art around and I let out a gasp. The art was of St. Brigid, the Celtic Saint of Fire. In this painting, Brigid is looking straight ahead, holding a diamond in her hands, and wild flames are exploding from her being. The painting is full of fire. I lay my head down on the piano and wept. I just could not believe it. I could not explain it. I could only hold in wonder what had just happened. 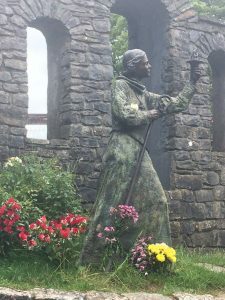 And so, when I began to make plans to go on pilgrimage a few months later, I realized I needed to go to the land of St. Brigid. I had known of her for years, but suddenly she became someone for me to draw close to. There are many stories around St. Brigid and I only know a few. I found out that she was accidently ordained a bishop instead of a priest and ran a community for men and another community for women in Kildare, Ireland. She was known and well-loved across the country for her love of the poor, generosity of heart, hospitality to all, ability to solve tribal conflicts and her deep devotion to prayer. She lived around 450 AD and was a big influence in the Celtic church. Kildare means ‘Church of the Oak’. Brigid was deeply connected to her landscape and the oak tree was significant to her. It is also known that she loved to pray by a spring of water where water still flows up through the ground. I have often looked for women in leadership who can be a role model for me in the path of service and courage. They have been hard to find. But in St. Brigid I find an invitation to be a woman of integrity and strength. To be honest, I don’t really know where Life is leading me, but when I am overwhelmed, when I am afraid, when I don’t know the next step, my prayer is to be filled with the fire of pure love.